where they turn to bite you when you saddle them up. We have also seen people adjusting their saddle when riding down the trail or in the arena, swinging the saddle back into position with their rear ends. Worse, we have all seen saddles slide when we put our foot in the stirrup to mount. All of these issues are caused by a cinch or girth that is too long. Wait, you say, I have always used this length cinch and I’ve got a horse that is 16 hands. He’s a big boy. Take a look at the horse in this picture. He has a heart girth of 88". That means he measures 88" around his body at his girth groove. He is 15.3 hands and weighs 1200 pounds. HE IS A BIG BOY! Yet, he is ridden in a 24" cinch. How can this be! From the front all horses have the same basic shape, high withered or no withers. The widest part of their body is at the apex of the curve of their rib cage. If your cinch or girth ends are above this point, no matter how tight you pull the cinch/girth, you will never get enough grip. The body of the horse is sloping inwards towards the spine above this point. Your saddle will slide forward and back, your cinch/girth will slide down towards the widest portion of the horse (the apex of the curve of the rib cage) and your saddle will slide from side to side, if not under the belly of the horse. The worst thing is you are choking your horse as you pull tighter and tighter. All horses breathe. Yes they do, and when they breathe they expand their rib cage (chest) to allow their lungs to take in air. Imagine if you were going out for a run and someone tied a rope tightly around your chest. It would be difficult for you to breathe and you would most likely find this be very annoying. I’ll bet you your horse feels the same way. In fact, he probably tells you he doesn’t like this when he turns his head and tries to bite you when you saddle him up. If you’re female and wear a bra (all you wild child’s from the sixties and men will have to imagine this) you have experienced the same feeling. When you breathe in, your chest expands and the wire foundation digs into your chest. That’s why they invented sports bras. If the cinch/girth is below the apex of the curve of the rib cage, you won’t have these problems. The body of the horse is sloping out towards the cinch. You don’t have to pull as hard to tighten the cinch/girth. You will get immediate grip so your saddle won’t slide back and forth. The cinch can’t slide from side to side either since you are already at a widening portion of the horse’s body. Most importantly, your horse can breathe. The cinch/girth won’t constrict the expansion of the rib cage when the horse breathes in air. The horse will be more comfortable and will be less likely to bite you. So how do you really know what size cinch/girth is right for your horse. We have all seen articles in some flashy magazine that says if your horse is 14 hands you need a small size and if you horse is 15 hands then you need this size. If you horse is 16 hands or more, you can’t go wrong with the biggest size available, they’ll say. Obviously, these folks have never seen my 4 foot tall grandmother who was 5 feet wide. There was no way a 20" belt was going to fit around that woman’s waist. Not a very scientific way to approach this subject. What is purported to be a more scientific approach fails to be accurate as well. The "Golden Rule" , where you measure the horse’s heart girth, divided by 2, and then subtract 3" , is supposed to give you the correct cinch size for your horse. If we use the gray horse, in the photo at the top, we can see that this doesn’t work. This horse’s heart girth is 88". Divide by 2 will result in 44" and then subtract 3" and you get a cinch size of 41". I don’t think so! There is only one way to measure the size cinch/girth that is correct for your horse. The buckles of the cinch must be clear of the elbow and yet still be below the apex of the curve of the rib cage. 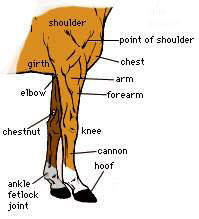 Looking at this closer look of the horse’s front leg, we can see where the elbow is. We can also see where the shoulder and the point of the shoulder is. This is not where the cinch/girth should be. The lowest point it can be is about 3-4" above the elbow. This will allow for clearance when your horse brings his leg back. There will be no interference at this point. If you take a string and hold it on one side of the horse at a point 3-4" above the elbow, and then run it under your horse to the opposite side at the same point (3-4" above the elbow) you will have measured the length of the cinch/girth you horse needs. Simply place the string against a yard stick or tape measure and you will have the exact length. May people who use 30"-34" cinches/girths will be very surprised by what they find. The length for most horse’s will be between 24-26" no matter how tall, big, or type of confirmation. Some horses will be less. I know this sounds different, maybe even strange. But try it. Measure your horse or borrow a smaller cinch/girth from someone you know and give it a try. Your saddle will be more stable. It won’t move from side to side or front to back. Your horse will take a deep breath and a sigh of relief.